It is said that Hamisa Mobetto could be expecting her third child, but when Zari got to learn of this, she said that it was fine, she could have up to 10 kids with him if she felt like. This is coming at the time when the Wasafi TV boss has just bought his baby mama a mansion and sources add, the pregnancy is the reason he bought her the crib. At this rate, the Salome video vixen, Hamisa Mobetto, will soon be a mom of three the reason her baby daddy bought her a mansion. Sources close to the Tanzanian socialite claim that Mobetto is pregnant for the third time. But the Iyena video vixen, Zari Hassan, is not bothered about the development, if anything, the mom of five adds that Hamisa is free to have up to 10 kids if she so wishes. "Ila Zari kuwa makini kuna tetenzi huku mtaani kwetu kuwa Hamisa kashaanaza mimba nyingine ila lisemwalo lipo kama halipo laja," A one Rahel wrote on her timeline. "Azai Ata kumi Mi Simwo," Zari responded almost immediately. It should be recalled that earlier on, Zari came clean on her relationship with baby daddy, Diamond Platnumz, they will only be co-parenting, but nothing will go down. Meanwhile, Hamisa Mobetto’s mom is all praises for her now, son-in-law, Diamond Platnumz. 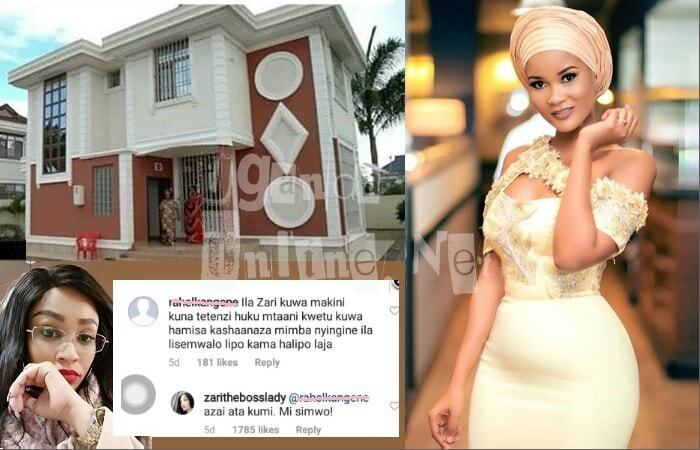 Hamisa Mobetto’s mom, Shufaa Lutigunga, confirmed further that its true Diamond Platnumz bought the house though he bought it for their son, Dylan and not Hamisa. Had it not been for the birth of Dylan, we could still be renting, she added. Diamond also has the key to the mansion and he is welcome to pop in after all, it is his house too and he has spare keys as well.